ESPN’s coverage of the Alabama vs Auburn COLLEGE FOOTBALL game was far and away the biggest show on Saturday cable, with a 4.31 rating that more than doubled the network’s earlier Florida vs Florida State game at 1.86, with the noon game at 0.65. Hallmark’s Saturday movie was at 1.00, up three-tenths from the previous week’s movie, while Lifetime’s movie was at 0.52. Animal Planet’s PITBULLS & PAROLEES nearly doubled last week’s rating to 0.65. 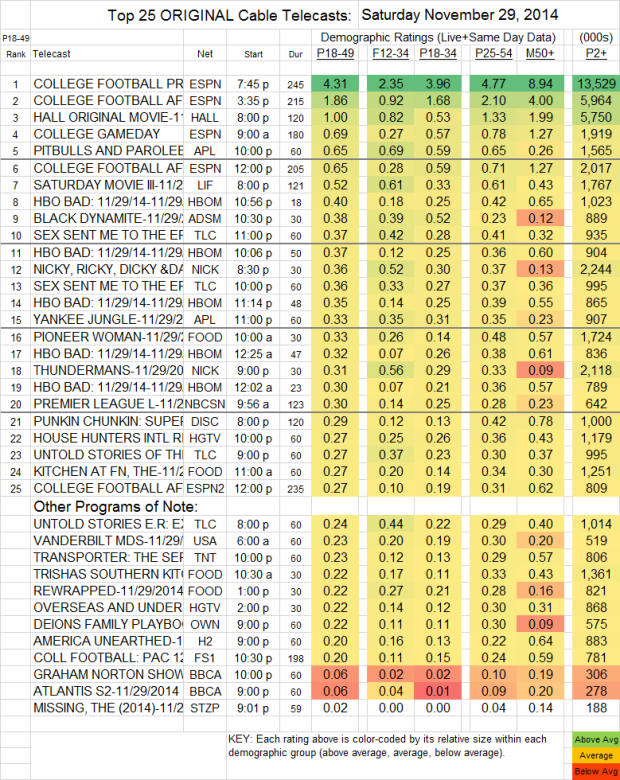 BLACK DYNAMITE (Adult Swim) fell 0.06 to 0.38. Various segments of HBO’s BOXING AFTER DARK were at 0.30-0.40. TRANSPORTER (TNT) lost 0.03 to 0.23, and ATLANTIS (BBCAmerica) was at 0.06. On Starz, THE MISSING was at 0.02 with 188K total viewers, up over a hundredth in 18-49s and down 9K in viewers.